While Manila has become a global playground for our palates, I’ll never lose my love for Filipino food. While the classics reign supreme, there are times when I’m in the mood to be entertained by whimsical twists and tweaks on tradition. 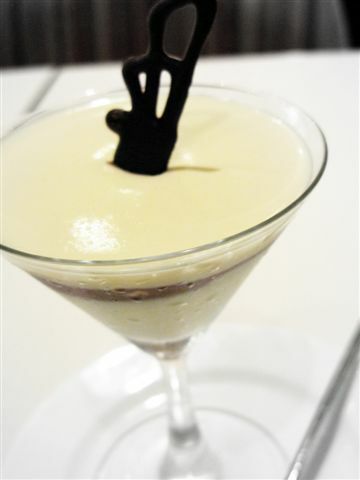 One such place that does this well is C2 Classic Cuisine, a restaurant of the Cravings Group. Considering that the restaurant is a training ground for students of the Center for Culinary Arts (CCA), I’m surprised by how seamlessly the service and the quality of food mesh so well together. 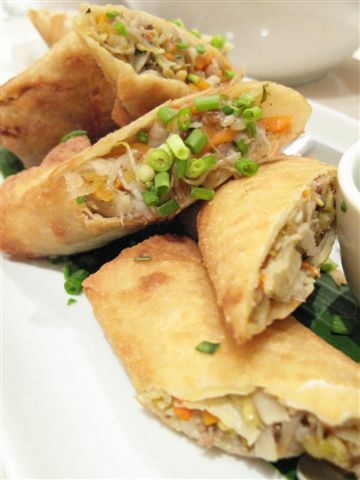 The Lumpiang Lucena (P180) quells my craving for something crunchy and vinegary, spring roll wrappers stuffed with shredded longganisa, vegetables, and grated young coconut. Its garlic-vinegar dip is cheek-puckering and opens up the appetite. Because C2 is a place where tradition meets innovation ”“ a culinary pushing of the envelope, if you will ”“ I’m not at all surprised when the kare-kare (P475) I order is served de-boned atop a mound of the customary roll call of vegetables: string beans, eggplants, etc. A large receptacle holds the thick, peanutty sauce, but unlike the viand it’s meant to grace, it’s too viscous and is in desperate need of more flavor and less of that unnatural orange flavor (an overload of atsuete [annatto], no doubt). Undaunted, I push aside the offending orange sauce and ask for a dip of soy sauce, vinegar, and calamansi. Much better. One dish that needs no doctoring is the Pork Humba (P275; cover photo), which is essentially pork belly (or liempo) that’s slow-cooked in a panocha sauce until it threatens to fall all over itself. Unctuous, with echoes of peanuts and needing hardly any chewing on my part, it’s one of those meat dishes that dissolves on the tongue. C2 has a mighty impressive dessert list. The restaurant is much renowned for their Bibingka Soufflé (P145) which has won awards for its ethereal mélange of coconut custard, salted egg, quezo de bola, and toasted coconut. 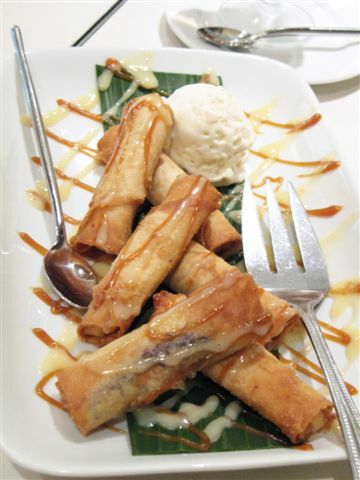 But as I said, I’m in the mood for all things that shatter in the mouth, so Turon ala Mode (P145) it is. The twist given to this street food is the ube smeared on the banana filling, its spring roll wrapper laced with a langka sauce. With a scoop of vanilla ice cream, this is one of those definitive hot-meets-cold desserts that tantalizes the taste buds. I have high hopes for the Pastillas Panna Cotta (P135), which promises to be “a perfect blend of rich milk custard with pastillas morsels.” It’s good on all counts, just enough gelatin to set, and I can actually taste the pastillas though they’re not in morsels, but rather blended into the custard. There’s a layer of chocolate however, that while good, totally overwhelms the subtlety of the pastillas, rendering moot its delicate carabao milk taste. I like C2 as well. Love their Salted Egg Rice! For dessert, the Bibingka Souffle is my favorite — it was such a surprise the first time I tasted it! The ube shake’s pretty good, too, but I like it without the sago. If you like C2’s turon, you might also like Kanin Club’s Halo-Halo Turon, and make sure you order it with macapuno ice cream. The turon is so big that you need the ice cream as counterpoint. And I think macapuno goes much better with it than vanilla, since it’s much more Pinoy. In case you haven’t tried Kanin Club, they have several other twisted Filipino dishes worth trying like Crispy Dinuguan and Daing rice. Is it safe to say that the C2 you tried out was in Shang? I suggest you try the one in Rockwell; they have better cooks, hence better dishes. Just my two cents. the husband: I was at the C2 in Rockwell. Never been to the one in Shangri-La Mall. Too bad. You win some, you loose some. Must haves also are their Chocnut Tiramisu and Dayap cupcake. Okay… now I am hungry. This is my first time to post but have bookmarked your blog and been dropping by for a year now! Excellent reviews! and great photos! To husband: Dine with the wife that way you both win! I do. And sometimes I get lucky! I agree, you can almost taste the food with Lori’s writing. hi, been following your blog, but first time to comment here. the kare kare @ C2 rocks, as does the bibingka souffle. a great place to take balikbayans! I love C2! i didn’t know they are the training ground for CCA students.. Anyway, i always leave their resto feeling sated and happy. And prices aren’t that bad either. lori, you have to try their tilapia dish as it is just divine! its quite simple but it has a taste that i have never come across before. these are crisp fillets of tilapia which lie on a coconut cream sauce. they have pineapple relish and potato hay to play up the texture of this gentle-tasting fish. simple tastes but they truly make a medley when combined. i’m one who really looks for texture in food to the point that my significant other mocks me about it. 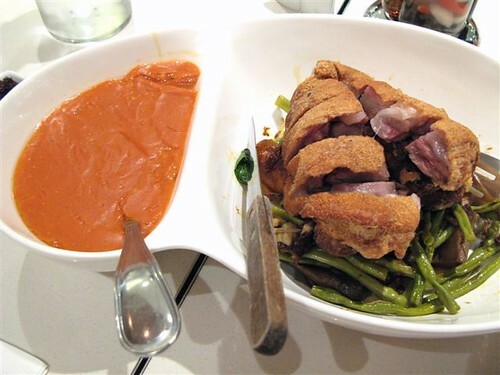 but after he tried this dish, he couldn’t say enough praises for the texture, and the taste of course. Hi Lori. I went to C2 Rockwell this afternoon. Found myself suddenly wanting turon for merienda while waiting for my mom and sister finish shopping at the bazaar. The menu looked exciting- there were a lot of dishes I wanted to try but decided to stay focused and get my turon fix. My mom and sister joined me later and they had the bibingka souffle and the guinataan. The turon was ok, not too keen on the ube though,- its dense, earthy flavor dominated the whole thing. I like the turon served at CCA functions better. The one with langka inside and served in shot glasses with caramel. The souffle was a total disappointment. It is a great idea but I guess I was just expecting them to execute it differently- the flavors were vaguely familiar but together with the texture, the combination was disconcerting and was not in any way evocative of bibingka. Still, I am looking forward to going back for the main dishes. I hope that will blow me away. Service was excellent, so was the buko juice. Ok overall, I actually finished my turon. Couldn’t stand the souffle but mom finished it, my sister was weirded out by the guinataan and had it packed to go. this is the first time i came accross your site. the service at c2 midtown is great. try the binagoongang lechon kawali, and their aligue rice. also try their kapeng barako, served with condensed milk (with free kapeng barako polvoron)- yummy. they used to have a chocnut fountain, where you dip native kakanins like suman, fried kamote and saba, etc. i just don’t know when they’ll have it again. That’s a horrible looking humba. Not the humba I grew up with. Well…that’s not the Kare Kare I grew up with either. You should’ve used the cheap camera on this entry.